Saturday we drove down to Dutch Wharf to say hello to Pegu Club and check out the engine progress. As avid DIY’ers it felt very strange to see that things are being completed without having to do anything but write a check. I think we could get used to it, but alas, the bank account won’t let us! Sam at Dutch Wharf has been doing a great job keeping us up to date, but it was still fun to see everything in real life. Our Firefly batteries arrived just after Jeff got out of the hospital. Given their weight we knew there was no way we could install them ourselves, so that was our first non-engine outsourced task. We knew they wouldn’t fit in the existing battery box, so the guys removed it and did a new install that looks like it’s always been there. While the engine was out Sam called and said the 40 year old fuel tank looked a bit suspect and the fuel tank hoses weren’t looking too good either. We had planned on pulling the tank out to inspect it prior to Jeff getting sick, and we had bought an extra five gallon diesel jerry jug in anticipation of the task. After briefly debating whether I could just pull it out myself, we ultimately decided to have the guys do it – our second non-engine outsourced task. A pressure test confirmed that it was time to get a new one. Cross that off the to-do list. Since we were getting a new engine and shaft, we figured we might as well have the cutlass bearing taken care of and a new PSS shaft seal installed. We’ll consider that an engine-related task! Although we had replaced the packing in the stuffing box last winter, we were tired of the water in the bilge that resulted from the drip-drip-drip. We had heard good things about the PSS and checked it out while were at the Annapolis show in October. Now seemed like the logical time to install it. This is the marine version of buying a new dishwasher which leads to an entire kitchen remodel! The highlight of our visit was seeing Big Red, our Beta 16, in its new home on Pegu Club. We knew from the spec sheet that Big Red was a bit smaller than Thumper, but it was amazing to see by how much. We had wanted to put some insulation in the engine compartment but haven’t been able to do that yet (and since it’s not essential it will not become our third non-engine outsourced task!). Clearly, having enough space to easily do it will not be an issue. So much room – and sturdy new mounts on the stringers! We were also pleased to see that an above-the-waterline water strainer had been added (bottom right in the picture above). It’s something we had wanted to do, and now we don’t need to. On our way home we were laughing about how small Big Red looked. You can certainly tell that our philosophy is that the engine is truly an auxiliary part of the boat, only to be used when the sails can’t be! Saturday’s visit will probably be the last one until Pegu Club has been moved back outside which should occur in a few more weeks. While Jeff has been able to increase the length of his walks (hitting a mile last week), climbing a ladder really tires him out. Hopefully that will improve as the weeks go on, but in the meantime we’re strategizing about what must be completed while Pegu Club is on the hard vs. what can wait until she’s in the water when we won’t need to use a ladder to access her. The only mandatory inside-the-cabin project at this point is finishing up our electric project and installing our transducer. I’m sure we could have Dutch Wharf do it, but I’m already hyperventilating over what I anticipate will be a not-insignificant bill from them, so I’d rather finish both of those projects ourselves if possible. Right now we’re thinking that we’ll crimp the cable ends down on the ground, and then I can go up and run the wires while Jeff works on something else on terra firma. We’ll see how it goes. Whatever we decide, we’re down to around 10 weeks until we splash. It can’t come soon enough! Posted on February 12, 2018 February 12, 2018 by KimberlyTagged Beta, CHF. Next Next post: Making our bosun’s chair. One word on those MRBF fuse holders you have. They’re installed incorrectly. 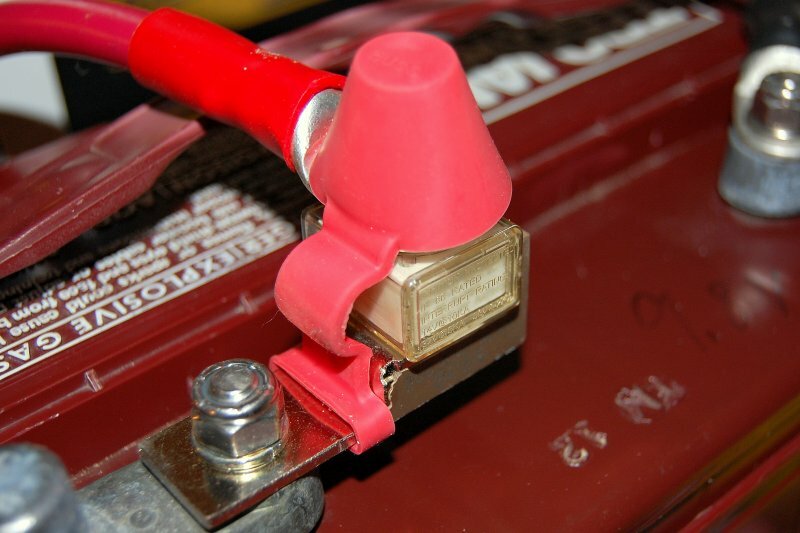 The battery cables go on the other end, over the fuse like this. Hi Victor – Thanks for pointing that out! I’ll check on them again next time we’re at the boat.